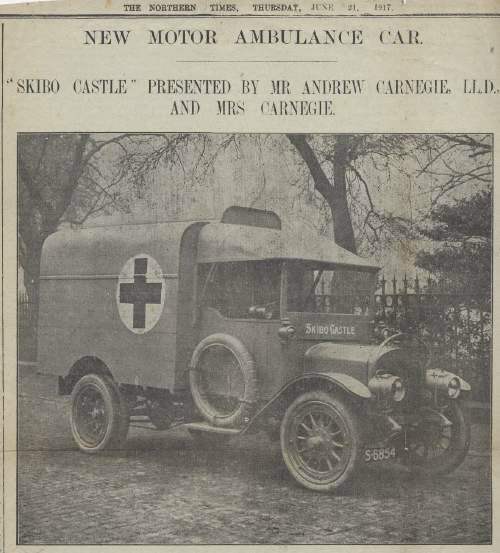 Extract from the Northern Times of Thursday June 21, 1917 with a monochrome photograph and details of a new motor ambulance car 'Skibo Castle' presented by Mr Andrew Carnegie LLD and Mrs Carnegie as a result of their £1,000 gift. The article includes detail of an earlier car provided by the County, plus details of the Red Cross Appeal Week and a meeting held in Dornoch of the Local Red Cross Committee. The photograph shows the name 'Skibo Castle' below the windscreen of the ambulance and its registration number S 6854.